On the day of our diaconal ordination each one of us was handed a copy of the Book of the Gospels while we listened to the bishop’s words: “Receive the book of the Gospels, whose herald you have become”. This short rite is unique to diaconal ordinations. It emphasizes the deacon’s exceptional character as communicators of the Good News of Jesus Christ. Throughout our ministries, every Sunday, we strive to fulfill this important office through the reading of the Gospels and our preaching at mass. But, in a world of instant communications, 30 seconds news clips, and the ability to touch millions of lives by the pressing of a single key on our cell phones, is our Sunday service enough? How can we extend the reach of our ministry to not only the people who come to mass on Sunday but the ones that stay away? What about the millions out there who hunger for the good news that have never been exposed to the Catholic truth? This read is a great point of departure to find the answers to these questions. The book is divided into 11 chapters; each written by a New Media personality; each bringing their unique perspective and particular experience of online pastoral and lay ministries. Some names will sound familiar, Fathers Robert Barron and Dweight Longenecker, Mr. Mark P. Shea; others might be less easy to recognize, but all engage you in a direct and simple manner. You do not need an Information Systems degree to understand what each writer is saying. In here you will find advice ranging from how to engage people and perform online apologetics, to how to use social media and collaboration tools to reach the people of your parish beyond their Sunday mass experience. The beauty of this little book is that each chapter stands on its own, but each is part of the overall idea that “the church belongs where the people are, and in this day and age the people are online”. The only critique I give to this work is this: If you are looking for help creating a blog for your homilies or a mailing list for your CCD class, you will be better served by consulting some other book. The Church and the New Media assumes you either have the knowledge to do this or you can find someone who will help you; however once you are up and running, this is the definite source for making the greatest impact in the least amount of time. 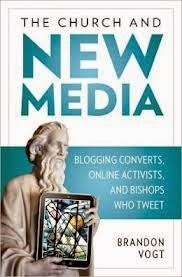 On a personal note, the most helpful chapters to my ministry have been Scott Landry’s “Innovative Shepherding: New Media in the Diocese” and “High Tech Community: New Media in the Parish”. Both gave me great ideas for adding a “New Media dimension” into my own ministry by helping me with placing my homilies online and creating my own personal blog. In short, I think every priest, deacon or bishop who is serious about expanding the reach of their ministries, should make reading this book a priority.